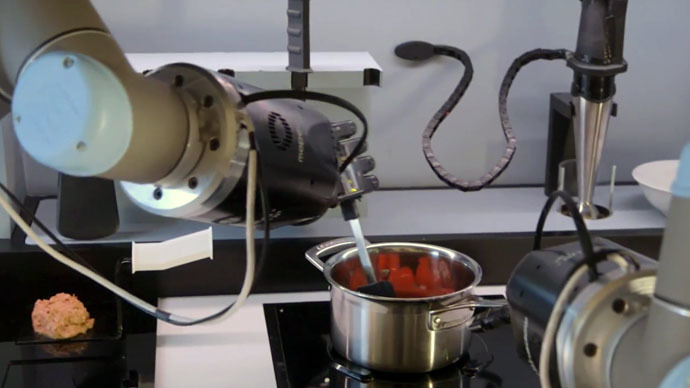 A British tech firm has co-developed a prototype ‘Robo-chef’ that is capable of cooking a meal from scratch. The machine’s major innovation is its sophisticated robotic hands, which mimic the behavior of humans in preparing food, enabling it to chop, whisk, beat and stir. A YouTube video shows the robotic arms pouring two shots of vermouth into a pot of soup and stirring it in a natural human way. While it sounds like science fiction, the robot’s makers hope the machine will be available for purchase within two years. The device, which may feature a built-in refrigerator and dishwasher, is designed so it can be installed in high-tech kitchens. Owners of the machine will be able to order dinner on their way home via a smart phone app. The robot’s developers intend to supply it with a collection of recipes, but users can also share their own culinary delights on a website. Gourmands will be able to enjoy having their own chef on call 24 hours a day for a princely £10,000. California-based Morley Robotics teamed up with the UK’s Shadow Robot Company to create the automatic cook. The London-based firm spent almost two decades developing the robot’s hands, which consist of 24 motors, 26 micro-controllers and 129 sensors. Working from a small office in Islington, the Shadow Robot Company usually sell a few dozen hands a year to other scientists. ‘Robo-chef’ is likely to open up a new market to the technology firm, as Morley Robotics engineer Mark Oleynik suggests the machine will be able to make Michelin quality fare. “All the things which are possible with the hand are possible here. There is no limitation,” Oleynik said. “A lot of people want to go to Michelin-starred restaurants, but they are quite expensive and may be quite far from the home. This is an opportunity for people to enjoy very good food, and for a reasonable price,” he added. The only dish currently off the menu is sushi, which requires careful pressure and precision beyond the robot’s capabilities. Shadow Robot’s Rich Walker believes the machine will ultimately overcome its current limitations. He said it will eventually be able to cope with unexpected cooking events, such as when beaten eggs peak.